Monogrammed stylish laundry duffle. Head off to college, camp or exploring the countryside in style. Outdoor activities call for a functional duffel bag that is also fashionable. This bag is modern and bright in fun summer colors that pop in red, orange, blue and yellow. The base of the bag and handle contrast in a solid navy block pattern. With one large, easy-to-access compartment, the bag can be filled with all you need for a day or longer. A drawstring pulls the top closed and you have the choice of a carry handle or a strap for a hands-free look. Add a personal monogram for a classic look. Matching accessory pieces include small laundry item CC-CLB92087, open tote item CC-TRAV92216 or beach duffle item CC-BBD92049. 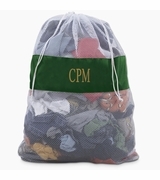 Monogrammed cotton canvas camp duffle measures 25"H x 13" x 13".